Hope you all are having a great week! We still have 4 weeks until we start back-to-school meetings, but I went back to work this week at my admin. internship and I am loving every second of it! I wanted to stop in quickly tonight to post about these little lovelies that people have been asking about! I was SO inspired by Ron Clark after reading all his books a few summer’s ago, and I went searching the internet for anything and everything I could find on him! 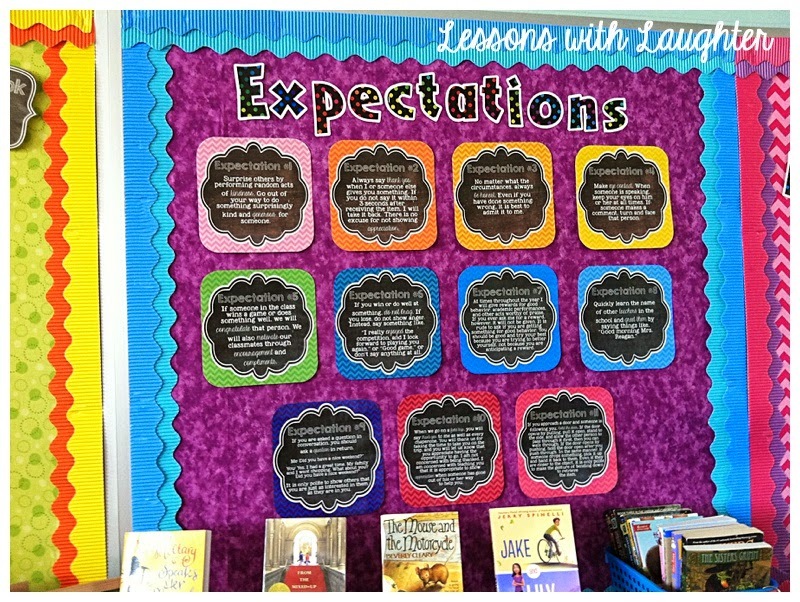 I came across Hope’s post and her Top Ten Essentials posters, which I enlarged, laminated, and hung in my classroom! 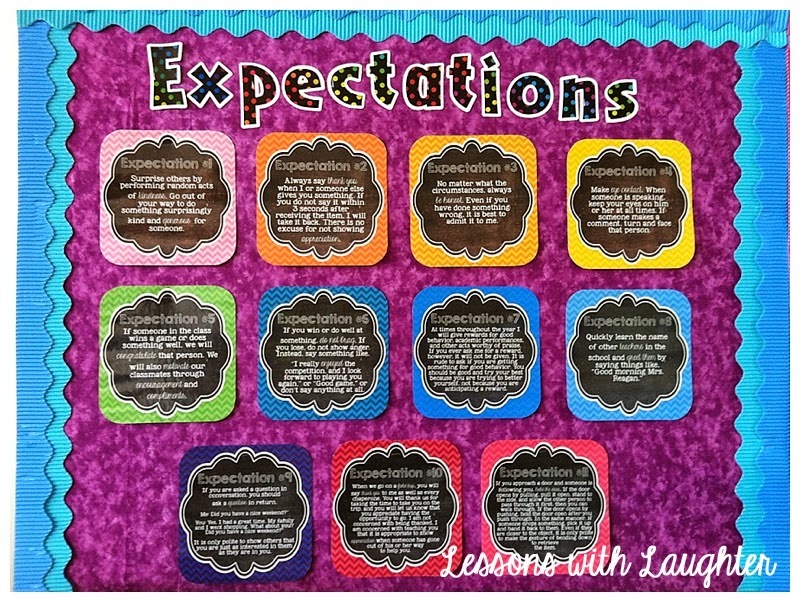 When I updated my classroom to a rainbow chalkboard theme, I decided to make new posters to fit that theme! The posters aren’t super large, but we refer to them frequently, so my students remember the gist of what they say, even when we are up on the front carpet! You can grab these for free here. Or click here to go to Hope’s blog to download her version! I hope you can use these in your classroom! I have been wanting to visit the Ron Clark Academy forever and I think I am finally going to make it happen this year!!! Fingers crossed!! I’ve had several product requests lately and I’m working on adding/updating them in my TPT store over the next few weeks, so keep your eyes out for them! If you follow my store you can keep up with all my new product postings! Wonderful! Thank you. I think I will also put these into my welcome back powerpoint to present to both parents and students. This are freaking amazing!!! I can't wait to hang these up!!! omg. LOVE LOVE LOVE these posters!!!! LOVE Ron Clark and I love your posters … thank you for sharing your time and talent! These are amazing, Molly!! Thank you so much for sharing- I will be printing and laminating these ASAP Love!! These are very nice. Thank you for sharing these posters! Molly, these are wonderful! What a great way to create a safe classroom! Hey, I just came across this blog post and I LOVE these. I was just wondering if you by any chance have an editable one. I like the ones that you have chosen, but I would like to add some. If you added them to your TpT store I would purchase them in a heart beat. Please think about it. Hi Connie! Thanks so much! I don’t have an editable version of these ones! Sorry! LOVE THESE! How did you make the template? I really want to make these but change them a little and add some more. Is there a template or something? Hi Samantha! There is a template you can download at the bottom of the post. It is completely editable so you can move things around however you would like! Hi!. I was trying to find the template download. Can you share again where that might be? ?